Welcome to our AndroidTM Demo site! ¡Bienvenidos a nuestra página de demostración Android! We are developing several remote management technologies. 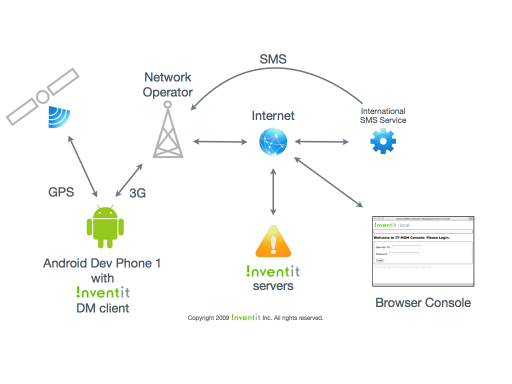 management applications on Android based devices. The demo shown below is just a prototype. We have now enhanced the lock feature on our commercial service - MobiConnect. We will upload new demo videos introducing the brand-new lock feature soon! Visit here if you cannot view the videos in this page. The demo shows controlling remote Bluetooth devices through an Android handset, which behaves as a service gateway to dispatch requests from a remote browser to the devices. We use Bluetooth as an interface between Android gateway and the target device in this demo. In this demo, please assume the small laptop as a Bluetooth device like a home appliance, such as a TV, a HD/DVD recorder or an air conditioner, or ... anything controllable with Bluetooth! Note that in the Android 1.5, it has not yet supported Bluetooth API officially, see below for more information. #Android 2.0 now supports Bluetooth API. We'd used Android 1.5 when we created the video demo app. The demo shows remotely locking/unlocking a handset. After the handset locked, it cannot be unlocked unless some one enters a valid Google account that activated it. Unlike "Wipe", locking is done very QUICKLY whereas wiping usually takes very long time (an hour or more depending on the data size). The demo shows remotely getting location of a handset, which is derived from either GPS or WiFi based location provider. The demo UI generates a hyperlink to Google MapsTM to point the location on the map. The feature is almost the same as Apple's Find My iPhone on MobileMe or SmartPhoneTracker for Windows Mobile. Android OS 1.5 downloaded from HTC support site. NTT DoCoMo's USIM with Mopera U plan (Softbank network is available as well. 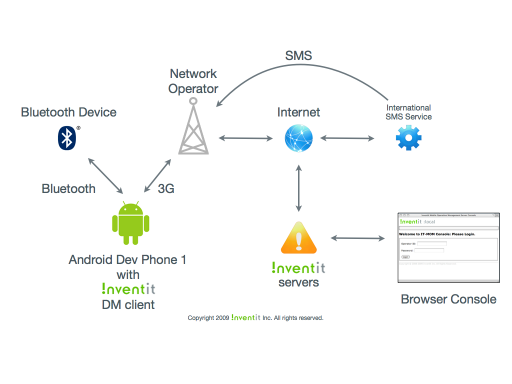 Android SDK+Java based OMA-DM client by Inventit Inc.
Android SDK+Java based Bluetooth client by Inventit Inc.
Java based Bluetooth server by Inventit Inc., which triggers Rhythmbox media player. The following figure illustrates roughly our system deployment working in the demo videos. We used Bluecove API to run the ASUS Linux box to talk with Android. Android and Google Maps are trademarks of Google, Inc. Copyright 2009 Inventit Inc. All rights reserved.